You might be interested in organizing a public discussion about the drug war. You may only be a 'committee of one' today, but it's likely you already know others who might help you publicize and prepare. A public discussion about failed government policy in a democratic society is always necessary, and mandatory -- especially when large numbers of people have questions about a particular law or policy. Therefore, one good reason for scheduling a public discussion is to honor our country's traditions of assembly, speech and citizen government. It's an excellent space for like-minded people to meet, and a place where people of opposing views can peacefully square-off. Expect some opposition if you call a public discussion, or include one in a series of events. The 'drug war' is a massively failed, complex government control-policy demanding widespread public comment on what should replace it. Imprisonment, prison abuse, and re-entry are unresolved issues. A public discussion should include enough time for all people to speak. Remember, too, that it is a highly charged issue and expect emotion. People who refuse to attend any more 'planning meetings' will still be likely to attend a public discussion. People with only slight interest in drug war injustice, or imprisonment -- may have keen interest in a public discussion on such subjects. Long before a public discussion can convene, you will answer What, Who, Why, Where, and When? Don't hesitate to use recent local events as good reasons to call for public discussion. A public discussion is held so that many people can speak and be heard. Showing respect for those who join a public discussion includes not scheduling speakers who leave little or no time for audience participants. 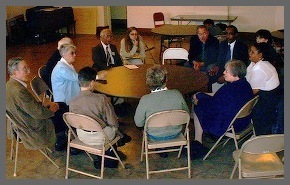 If it's a small gathering of ten to twenty people, participants will listen, talk and learn better if seating is arranged in a circle. One critical objective for this meeting is ensuring that speakers know they're being heard. Let's call this 'paying attention to the process' of learning. It's as important as the message you long to teach. If you are expecting more people than time allows to speak, be sure there's a volunteer available who will pass out paper and pencils to people as each arrives. People arriving can put their names on a piece of paper if they want to make a public comment. The meeting facilitator will call on people as there is time, and in order of turned-in names. Smaller groups can use more informal public comment rules, but every meeting should have a pre-appointed meeting leader. As part of a November Coalition Journey for Justice in Charleston, South Carolina in 2003, a public discussion took place on campus at a college-sponsored forum called "Evaluating the War on Drugs." The community was encouraged to attend, and the focus for the evening was 'prisoners in the war on drugs.' It was held in an auditorium, filmed by the college, and featured two speakers and a video. Questions and comments from the 75 attendees covered many imprisonment and drug war subjects in the discussion. The informational table hummed for an hour after the event concluded, not a problem in the public area outside the auditorium. So it’s ideal to have a sheltered, public area available after the event. Many times people will stay to talk to organizers, special guests and your local members. In New Haven, Connecticut in 2002 a public discussion took place at a neighborhood church immediately following a public march and demonstrations at various criminal justice buildings -- police station, courthouse, then on to the jail. The march concluded in a large room of a community church where more than 100 people sat in a circle to join in public discussion. One after the other, each speaker shared reasons for condemning the drug war, and why laws and policing must be changed. Organizers also arranged for food service at the church. Imagine your own public discussion subject that would meet your group’s goals. Remember, current events make good public discussions. Below, you will find a list of some current news and events you can bring to your group.